For hoppy beers the ideal thing would be to brew them so they will be in the bottle the minimum amount of time before the comp, however due to work I will have to brew them 3-4 weeks earlier than I would have liked, so these beers will be as much a test of my bottling process as they will the brewing its self. The key here will be limiting oxygen exposure during bottling even though they will also be bottle conditioned. Anyway on to the crux of what this blog post is about – brewing hoppy beers and the process I will be using to brew the USPA, IPA and the DIPA, the process will be the same and it is the process that is the important bit! If you don’t brew a beer to the style guidelines you really are making life difficult for yourself! There is more than enough information on the web to point you in the right direction and gives plenty of detail on recipe design – The Brewing Network – Can You Brew It show is a great place to start! The base malt should be low colour pale malt, low colour Maris Otter if you can get it but low colour is the important bit. You want to be able to build in the malt base not be stuck with what you have been given by the base malt. I have used a variety of grist over the years for Pale Ales and IPA’s and I now have a couple of grists that I have honed in, the one given below is for the PA I will be brewing for the LSE 2016 comp. The only difference for the IPA is that 7.5% of the pale ale malt is substituted for munich malt, this is simply to give the beer slightly more malt base to support the high IBU’s and bigger hop flavour. The DIPA is a bit different it is simply 94% pale ale malt and 6% dextrose to make sure the FG is around 1.008! The idea here is the malt is simply a platform for the big hop aroma. A single infusion mash will more than do the job, and even though I have a RIMs system both the pale ale and the IPA will get a single infusion mash for 60 min. The RIMs system will however be used to stabilise the mash temp and guarantee a clear wort for the transfer to the boiler. The DIPA will be mash at 64degC for 60 min the ramped up to 68degC for 10min before being ramped up to 74degC for mash out, this is to ensure a very fermentable wort. I am trying to move away from stepped mash temps as if I ever have the daft notion of going pro trying to conduct step temp mashed on a budget will be tricky although not impossible – I have a cunning plan! The PA and IPA will receive a small bittering addition of Columbus totalling 10 IBU’s at the start of the 90min boil, and then the rest of the hops will go into the whirlpool. All hops are big popular US varieties like Citra, Mosaic, Simcoe, Centennial and Columbus. So into the whirlpool, and a big addition of hops is added for a 30min stand. The temp of the wort in the whirlpool is upwards of 97-99degC. Both of these beers will be 50L batches and the hop additions will be 220g from the PA and 340g for the IPA, the PA will get 45ibu’s from this addition and the IPA 60ibu’s. I’m taking a bit of a risk here with the IPA, I’m backing off the bitterness and really loading up the Whirlpool and dryhop additions to see if I can produce a softer more fruiter hop aroma centred beer as apposed a bitter kick in the teeth, which in the past is what I have had success with. As were are on the topic of whirlpool additions its worth noting that Brewdog has a heat exchanger fitted in between their kettle and whirlpool and they now drop the temp of the wort down to 80degC for the whirlpool addition, this means they are no longer isomerising as many of the hops acids so are getting a small contribution of IBU’s from this addition but they are getting a better flavour and aroma from the whirlpool additions. At the other end of the brewing world this is also something that the Tennent’s brewery in Glasgow does and latest research from VLB supports that the best aroma is gained when whirlpooled at 80degC ish. This is something I am very interested in trailing but would need to get a small heat exchanger made up that can deal with hop material without blocking for the transfer. The DIPA will be bittered with hop extract and then also receive a hop addition of 300g at 15 min to go before also receiving a massive whirlpool addition in the order of 450g, again for a 50L brew length. For big hoppy beers I really believe you should be using hop pellets for both the best flavour and aroma, to start with they have had 10% of the hop leaf material removed hence the name T90, they store better both from a size point of few and less prone to oxidation, and most importantly they can be used in a whirlpool! This is the bit I don’t understand in the UK most craft brewers are avoiding the use of the whirlpool they are just knocking out directly from the boiler, you can easily say the brewers in the US are leaps and bounds ahead of the UK when it comes to big hop aromas and flavours and I think a lot of this is all due to the use of hop pellets and the Whirlpool (and yeast but will get to that shortly). The whirlpool or at least whirlpooling is key to great hop flavour and aroma – in my opinion, it also ensure that the least amount of hot break material makes it into the fermenter which is also very important for product stability. Dryhoping of all 3 beers will take place once the primary fermentation has died down. The PA will receive only one addition, the IPA and DIPA will be double dryhopped. Time on the dryhops is limited to 3-4days per addition and all additions are made at 19-20degC. If a 2nd addition is to be added like in the case of the IPA and DIPA the first addition and the remaining yeast will be dropped out of the conical. Once all dryhoping is complete the beer in the conical is crash cooled to 2degC for 5-7days. The PA will receive a single 50g addition, this is simply to lift the final aroma a notch as to be honest the aroma from the whirlpool additions is more than enough. The IPA will receive 2 dryhop additions each addition being 250g and contact time will be 3days per addition. The DIPA will receive 2 dryhop additions, each addition being 400g! Again contact time will be limited to 3 days per addition. Nothing mentioned above is rocket science, but the secret to getting good hop aroma in building the layers of flavour from the hops and then limiting contact time with the hops and most of all keeping oxygen away from the beer! Dried yeast makes good beer but if you know how to handle wet yeast then you can make fantastic beer. I have been brewing with a wide variety of yeasts over the last 18-24 months or so and my favourite yeast has been Wyeast 1318, London Ale 3, it is my go to yeast for British styles and non dryhopped beers. This yeast combined with Citra hops in a 3.8% session pale ale is exceptional but when it comes to big IPA’s that are heavily dryhopped I just can’t get past the lack of clarity of the beers it produces. Even though they taste fantastic and I would happily drink them all day long at home, but for competitions they are just going to get marked down – it’s a shame but it’s the truth of it. As such I end up coming back to WLP001 and WLP007 probably the 2 most used strains for brewing IPA’s in the USA. In the UK this accolade would most likely go to US-05! The safe option and the yeast I have had most success with in the past is WLP001 but this time I thought I would try something a little different – WLP090, which is a yeast I have never used before but I have high hopes for, time will tell I guess. From the reviews I have read, it ferments like a beast, allows slightly more malt flavour to come through and still also lets the hops shine, and importantly its drops brighter than WLP001. Fermentation is extremely important when it comes to hoppy beers, a clean healthy fermentation is vital. For this the correct amount of healthy yeast must be pitched, and the use of yeast nutrients including zinc, and oxygen is vital. Below is my typical pitching rates and yeast propagation procedure. • OG above 1.100: as much as you can muster! Then use the above pitching rates in the calculator to calculate the starter sized required, all starters should be well oxygenated prior to pitching the yeast, and yeast nutrient should be used. Propagate on the stir plate at a temp of 26-28degC and once fermentation activity stops, stop the stir plate as continued oxygenation will just deplete the yeast glycogen reserves and reduce viability and vitality of the yeast. I would also avoid the used of cold crashing the yeast starter following propagation, the latest information shows that yeast which is cropped following cold crashing has a lower viability and vitality, if possible hold the starter at a temp of 13-15degC to aid flocculation and just give it another 24hours to drop. Typically yeast is pitched into wort at 17degC and is then allowed to free rise in temp to 19 where it is held till fermentation is 2/3 complete at which point it is then raised to 20-21degC depending on the yeast. I ferment all hoppy beers in conical fermenters and will do my best to ensure that a CO2 blanket is maintained at all times, once the yeast has been pitched oxygen and oxidation is the enemy! Once the fermentation and dryhoping is complete all the beers will be cooled down to 1-2degC where it will be held for 5-7days, this is to try to drop the beer a bright as possible before bottling and kegging. This is where I would like to change my process and will most likely be doing so over the coming few months. I would like to fit a spud valve to the fermenter and then use the last few points of the fermentation to pretty much carbonate the beer. I would also like to fine the beer in the fermenter using a vegan friendly finning agent. This will then enable relatively bright carbonated beer to be bottled and kegged directly from the fermenter. This then leads to the question is it worth using a product like to Brewers Clarex to deal with chill haze? For home brew – no, but if looking to sell the beer commercially may be yes not only does it remove chill haze but it also massively improves the stability of the beer, thus increasing shelf life. Even though all the beers will be bottle conditioned I will connect a beer gun to the fermenter, then excessively flush the bottles with CO2 before filling with beer. All the hoppy beers will be bottled to approximately 2.8 vols CO2, the DIPA will be re seeded with fresh yeast to ensure carbonation in the bottle. The hope here is to minimise any DO pick up and any that does occur will be removed by the process of bottle conditioning – you can brew the best PA, IPA or DIPA and all that effort is then wasted by doing a bad job on the bottling. The beers will then be kept at 20degC for 10days before being shipped off to the competition. Then it’s up to the judges! Well time for an update – the hoppy beers did not medal but I did pick up a few prizes along with coming 3rd in the Championship brewer comp. It seems that’s as the beer had to be brewed early and it also looks like I under carbonated a bit the beers just did not do very well – live and learn! 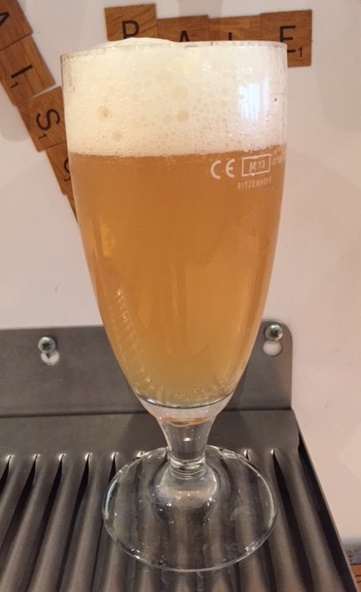 This is what i have come up with for the first attempt at a hoppy beer using WLP 002, its based on the IPA that did well at last years national but just toned down to a pale ale level – well a hoppy US pale a level. First off the starter – i will pitch 1 vial of WLP002 into a 4L starter on a stir plate and hold it at a temp of about 25-26degC, it should ferment out in under 24 hours, once the yeast has dropped the beer will be decanted off leaving the slurry and maybe 0.5L or less of not very nice tasting starter beer! The mash will be at 63degC for 60min, then ramped up and held at 68degC for 10min before being ramped up to 74degC for mash out and sparging. This will then be followed by a 90min boil, before being transferred to the whirlpool for the whirlpool hop addition and a 30min rest. The wort will be cooled to 17degC on transfer to the fermenter, oxygenated in the ferment at a rate of 1L per min for 2 min, and the yeast pitched at 17degC and then fermented at 19degC for approx 4days. The temp will then be raised to 20-21degC for a diacetyl rest and dryhopping. Following approximately 4 days the yeast and dryhops will be dropped (once diacetyl rest is complete) and the beer will then be crash cooled for 7days. Water will be 80%RO and 20 tap, with some salt additions to hit my standard pale ale IPA water profile. In theory this should be a 14 day beer from mash tun to package, and because the yeast will drop any haze left will just be chill or hop haze and no yeast to muddy the flavor, this haze could then be dealt with using gelatin during the cold crash. 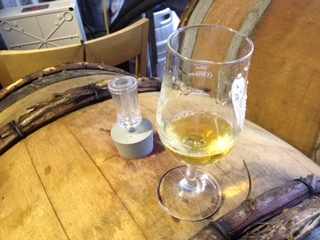 Back in April 2015 I brewed 2 x 120L batches of the Retribution Saison Provision (Dupont inspired Saison) that was transferred into a one of the Pinot Noir barrels in the garage, I have been tasting it every 4 weeks or so and on the last tasting it had really mellowed out and developed a very small and pleasant vinous note and had taken on a hint of colour/darkened slightly from being aged in the barrel. All in all pretty pleased. The plan is now to draw off 80 -100L of the Saison and to replace it with the next batch. The portion drawn off will be split 3 ways – 40L will be kegged for general drinking, 40L will be aged on Apricot puree with some Brett and Lacto, and the remaining will be bottled. The next batch of Saison will be brewed to a different grist, the plan this time is to try and leave a little more for the Brett and bacteria in the barrel to set to work on. The grist is based on a commercial beer called West Ashley – the rough grain bill was mentioned on one of the Sour Hour podcasts. The acidulated malt will be adjusted so I hit the right mash pH, it will be hopped with EKG and then fermented with WLP 565, I will try a blend of 565 and 566 at some point – maybe on the next solera batch. Following primary fermentation – pitching at 28degC and fermenting at 32-35degC, the beer will be cooled to try and drop as much of the yeast as possible then transferred to the barrel at which point I will add some additional Brett and Lacto to the barrel. I’m going to try/would like too develop a slightly tart and funky character to the Saison – maybe a more traditional farmhouse character? The IBU’s are a little high for the Lacto to do much though, so this lactic sharpness/character may have to be achieved through blending. I guess what I’m really saying is why as a craft brewing nation are new micros/craft brewers in the UK obsessed with using a very neutral US ale strain (us-05), and one that does not flocculate very well which leaves a lot of yeast in suspension at the time of consumption. I guess as they are trying to emulate some of the great US craft brewers, which if that’s true they really should buy a centrifuge and or filter set, or just fine in the tank and force carbonate before packaging so they can mimic there chosen craft brewers entire brewing process. But then again, who would you say is making the best Pale Ales/IPA’s in the US and what yeast do you think they are using? Are they using a clean US ale strain or British strains? It’s probably safe to say that consistently the best IPA brewed in the US over the last 8 years is Union Jack IPA it won gold in the GABF in 2008 and 2009, a silver in 2013, along with a load of other medals from around the world. And what yeast do they use WLP002, or that is what their brew master has said is the closest commercially available yeast, and WLP002 is known simply as the English Ale strain on the White Labs website, and most likely is the Fullers brewery strain. Stone Brewing has said the closest commercially available yeast to their house yeast is WLP007, this yeast is known on the White Labs site as the Dry English ale strain. Hill Farmstead Brewery which has just been rated by the rate beer site as the best brewery in the world is rumoured to use a British ale strain, although it’s not known for sure which one. If rumours are to be believed and you have to love a good rumour then it could well be something like Wyeasts 1318 the London Ale III strain or Wyeast 1099 the Whitbread Ale strain. I don’t know about you but im starting to detect a pattern here and yes it’s only a small sample of breweries and its far from statistically valid but arguably some of the best breweries the US has to offer at the moment are all using English/British yeast strains! The UK tends to follow the US in brewing trends so how long will it be before more micro/craft breweries in the UK move back to British strains in the search for more balanced beers instead of the bitter hop bombs that are the current trend. I guess the real question is can more of the new start British micros/craft breweries manage to shake off their addiction to us-05 and other dried yeasts and mover over to wet yeast? The big problem being the major lack knowledge in this area amongst both the new start, and some not so new starts! I have a feeling the next few years will be very profitable for anyone in the yeast consultancy business!